The next IN ICI WHO World Congress will be in Tunisia, 22. - 24. March 2019. The main topic is how NLP Coaching and Hypnosis can support learning processes in Education & Life-Long Learning. Life Long Learning can as well be understood as the roots of NLP, Hypnosis and Coaching. With NLP, Hypnosis and Coaching we support Life Long Learning for a wonderful present now and as a present to our children and us for a promising future. It will be mainly organized from the leading IN ICI WHO Institute "Alliance Psynapse Tunisia" in cooperation with PSYNAPSE in France. 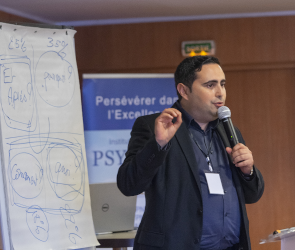 Sehil Triki is the Head of Alliance Psynapse Tunisia (Alfacom) and our IN ICI WHO Ambassador. Here the PDF of the World Congress. We are pleased to inform you that the next World Congress will be held in 2019 in Tunisia. This event will focus on "EDUCATION & Life-Long Learning". We are convinced that the use of NLP, hypnosis and coaching will help to creat education processes in a way that is appropriate to motivate learners. Gandhi said in speaking of education: "This world is what we have made of it. If it is ruthless today it is because we have made it ruthless by our attitudes. If we change ourselves we can change the world, and changing ourselves begins with changing our language and methods of communication"
In NLP, hypnosis and coaching, there are several techniques that can be used in the education context to facilitate learning, motivate learners and improve the quality of education. With NLP, teachers could assess the preferred sensory system that the individual uses, how the learner is mapping the reality and how he challenges the world around him. These information allow an adapted transmission system, facilitating forward learning process. Further, NLP tools will enable learners to program and replicate successful model. Hypnosis invites the teacher to be attentive to the vocabulary of the learners which will make it possible to adapt the content to be transmitted through a history or a metaphorical explanation thus favoring the fluidity in the learning. Further that, with hypnosis the learner will mobilize the resources of the unconscious, made up of forgotten experiences or knowledge, unexploited capacities that only need to express themselves. With all these tools, the learner will be able to reconnect with his creativity and ability to adapt to situations to achieve his goals and the teacher will have a "toolbox" in which he draws to support the work of learners. Nelson Mandela said "Education is the most powerful weapon we can use to change the world" Education gives young people essential skills, develops critical thinking and self-confidence, creating a healthy foundation for everyone to succeed in life. In addition to formal education, such as education provided by schools and universities, there are other forms of education that are becoming increasingly relevant. It is in this context that the next IN ICI & WHO World Congress will take place in March 2019 in Tunisia and will focus on the theme of education in order to complete and enrich the education system. We thank you for your participation in this international event which will be held for the first time on the African continent and look forward to your contribution with your conference topics that will build a bridge between the tools of hypnosis, NLP and coaching on one side and the educational system on the other side. More than 35 Speakers will be present in this World Congress to share with you knowledge, emotions and offer you new techniques and approaches. Join us in March 2019 and enjoy three days in the heart of NLP, hypnosis and coaching and become an actor of changes expected by new generations. The conference will be translated in French or/and English and recorded on video. You can easily reach the airport in Tunis for low air fares from many towns, the weather and hotel price is great, the congress topic is highly relevant, and you will meet extraordinary professionals from NLP, Hypnosis and Coaching from all over the world. This World Congress is the most important event for the IN ICI WHO community to enhance knowledge, share experience and meet precious like-minded. For registration details and fees see here. Our special Congress hotel price is for a single room 50 € for a night and for a double room 70 €. But hotels are often cheaper at tripadvisor or when you book it with your flight. Therefore we recommend to search for best prices. When you book the hotel through us you pay when you arrive. You can reserve also Transport between the airport in Tunis and Hammamet. The price of transport is fixed per trip/car, about 47 euro the trip (from 1 to 3 persons depending on luggage's volume). If you cannot come to Tunisia in March 2019, we will soon inform you about our next IN ICI WHO UCN World Congress in Brazil, 17-19 October 2019 (YES, 2019 as well). It is about Emotional Intelligence and organized by Bento Augusto.